Georgia Gubernatorial Candidate Defends Trump On N-Word: He Said It Before He Was President [VIDEO] - Joe.My.God. “He has his personal beliefs, his personal ideas. But I truly believe he is able to separate those from how he is running the country. He did not use the N-word as the office of the president. He used it outside in his personal life. If he was president and he goes on TV and uses the N-word, then yes, I would have a major problem with that. But he did it before he was president. “I don’t have a problem with Donald Trump having used it in the past as my president. Just because he used it years ago, in the past, not as our president, doesn’t mean we need to continue to berate him because he used it. And also, let’s go back in time. How old is Donald Trump? 70? Sixty, fifty years ago, we were not in the society we’re in now. People freely used that word.” – Georgia state Sen. Michael Williams, who recently lost the GOP gubernatorial primary, on CNN this morning. Start the first clip below at 5:30. RELATED: Michael Williams first appeared on JMG for his “deportation bus” campaign ad, which was later removed by YouTube for hate speech violations. 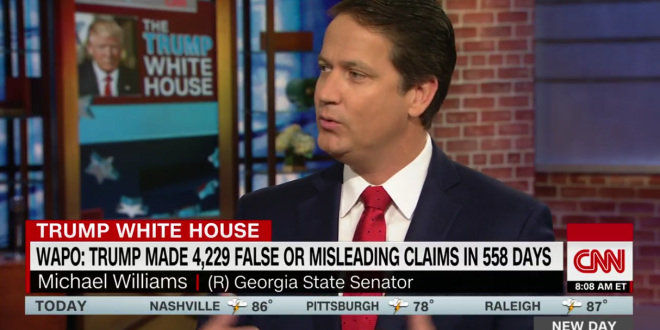 If it wasn’t coming from a southern Republican, this apologia on @CNN from Georgia state senator Michael Williams for Trump’s use of a filthy racial epithet would be breathtaking. “It’s OK because I haven’t heard him say it as POTUS.” Wow! Am I in the twilight zone? Georgia Senator, Michael Williams, just said that if the President of the United States used the “N” word before he was in office, it doesn’t count against him!!! Really!! !